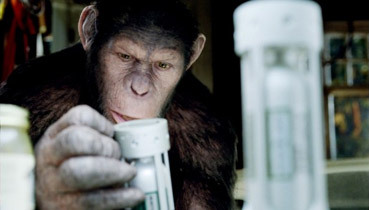 Andy Serkis's Caesar, the super-smart chimp. "What is a rebel? A man (or indeed a chimp) who says "No!"" Albert Camus (who found it unnecessary to include the chimp part). I would like to do this movie justice but I am running late. By the time you read this, the movie would have been out for a fortnight and unless it's doing some serious business, it may not be around for much longer, hence my rush. After a very busy bank holiday crammed full of doing the same stuff I normally do on the week days, I have had absolutely no time to salute a genuinely touching, exciting and thought provoking summer movie. I was a Planet Of The Apes aficionado in the 70s and still find the original (to which Rise is a clear and classy prequel) absolutely riveting. There is something primal and immensely satisfying in orang-utan Doctor Zaius's condemnation of mankind – he knows humans destroyed themselves but lets Charlton Heston's Taylor find this out for himself. That moment of revelation (oddly spoiled by the cover of the packaging of the latest DVD box set) is now an iconic part of cinema history. "You maniacs!" I'm sure you know what giant green lady he's referring to. So WETA's work on Rise, amply demonstrated in the trailer, is astonishing. Be assured. We sort of know we are not watching real apes (how could we be?) I had a discussion with my fellow cinemagoers that went something like this: "The first chimp we see is a real one…" I disagreed. "No, I don't think it is because comparing real and CG would break the CG spell." It's my belief (and as ever I'm happy to be proved wrong) that all the chimps in the movie are computer generated. Whereas none of us knew what Avatar's N'avi looked like and so therefore they were, by default, convincingly alien and exotic, we all know what a chimp looks like and how it moves. Yes, you are dimly aware of its animated origins and there are a few obvious CG clothing moments (I'd hoped they'd got those sorted by now) but the spell is woven and you never once allow the tech of its birth elbow you out of the story – and that's a huge plus. There were moments in the climatic battle where I was aware that I was actually genuinely excited and not prodded into a state of pseudo thrills by spectacle. Let me just say that the effects work is astonishing but please just enjoy the story as the film-makers intended. With one very notable exception, one that I'll get to soon, the story is basic broad strokes, placed in a narrative row to let the star of the piece earn his place as the progenitor of five other films (fittingly made in the past). Essentially, James Franco is keen to develop a drug that will eradicate Alzheimer's disease. His father is afflicted (a bemused and honest performance from John Lithgow) and of course, due to our genetic similarities, chimps are the guinea pigs of choice. After a test subject escapes and wreaks havoc on the hi-tech drug company, Franco is forced to take in a baby chimp and raise it as his own. Caesar learns fast, grows into a fine chimp in a lovely and well judged ‘growing up' montage high in the northern Redwoods of California's Bay Area. It's in this scene when he asks via sign language the heartbreaking question that defines his existence; "Am I your pet?" Any cries of risible anthropomorphism rallied against the movie must concede to a pertinent and irrefutable fact. We are (arguably) all primates and the percentage of DNA difference between chimps and us is a very paltry figure. The human characters do not enjoy the same depth of characterisation as the apes (should we be surprised?) and so while the narrative dallies over the humans' worries, we are thinking one thing and one thing only; "What's Caesar going to do?" This is Andy Serkis' movie. Yes, I appreciate the work of many of the other actors (Brian Cox trying to inject some layers into a disinterested primate facility owner, Tom Felton unfortunately asked to reprise Draco Malfoy sans wand) but in the end it's all about Caesar. In body language alone, it's a performance worth celebrating. Despite the high end tech that brings a lowly chimp to life, the movie is also prepared to have the audience work for its entertainment (something I love as long as I get what's being communicated). There were scenes in this movie that had me scratching my head at moment one and applauding the director at moment four. It's so refreshing as an audience member to be given the benefit of the doubt. Morally, Caesar also maintains the higher human values. It's significant that he resists killing when it's not necessary but also a tad disappointing when he leaves the fate of the boss of the drug company stuck inside a wounded helicopter to the scarred chimp that has many reasons for revenge. I think the film-makers missed an opportunity here to invest the chimps with an even higher moral sense than their captors. I've been lucky enough to work with chimps on a feature and get close to them directing a documentary. They are extraordinary animals and so physically dense that even youngsters make your arm ache after holding them for a few moments. And, hey. It's all muscle. Director Rupert Wyatt and actor Andy Serkis have created a hero whose plight you have nothing but sympathy for, whose rebellion you cheer whilst being aware that you are disrespecting your own species in all manner of ways. But then isn't that the point? The human animal comes off badly, a premise that never gets enough coverage. Our treatment of other animals has been and seems to be still appaling. Animals suffer pain because of human need and that shames us all. If Serkis' Caesar moves us closer in empathy to feel what they feel then the film would have succeeded beyond expectations. Last word – a movie character made me care. That character was created in a computer and guess what? I didn't care how it was done. Caesar lives. He really does. Bravo WETA.